"I hesitate, since this might be inappropriate," comments Ken, and pauses for half a beat. "OK", he says, and continues with the story. Stephanie laughs. We tour Kensington, sharing coffee and banter. Ken sips tea and lectures on gravity, Swiss medallions, and the risks of cliff-climbing on acid. 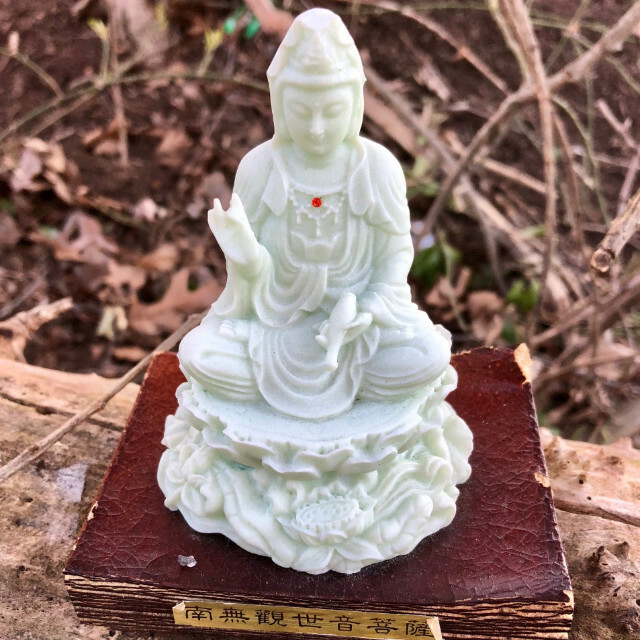 A cut-through stairway leads past a log where tiny Buddha sits in lotus pose on top of a wee book, one hand held up in a mudra, the other tipping a bottle. A red jewel glitters on the statuette's chest. Fascinating! "I don't have a Bracket!" somebody confesses. "We do!" others reply. A dumpster near Antique Row features a porcelain hawk posed to protect against pigeons. Wire-mesh art with mask and flowers invites a selfie op.